Clarke University celebrated Founders’ Day on October 4 with special events to commemorate its 175th anniversary. Founders’ Day events included Daily Campus Mass, community lunch, and the Barwick-Eppel Mail Center naming ceremony. Clarke was established in Dubuque in 1843 by Mary Frances Clarke, an Irish woman who founded a congregation of teachers and religious women, the Sisters of Charity of the Blessed Virgin Mary (BVMs). The congregation consisted of Mary Frances Clarke, Eliza Kelly, Margaret Mann, Rose O’Toole, and Catherine Byrne. Mary Frances Clarke tasked the group to teach without seeming to teach, to remain progressive with the times, and to encourage young women to think for themselves. Today, Clarke University continues this mission. Special guests for the day were members of the BVM Congregation, BVM Associates, and Ramona Barwick, BVM. Daily Campus Mass was led by Fr. Andrew Marr, Clarke Chaplain. Special music at Mass was provided by Anne Marie McKenna, BVM, and Clarke students Jackie Moss and Christian Perez. Catherine Dunn, BVM, served as lectern and Paulette Skiba, BVM, Mary Ann Zollmann, BVM, and Kate Hendel, BVM, served as Eucharistic Ministers. The community luncheon highlighted the culinary talents of Clarke Dining Services and featured Irish cuisine in honor of the Irish heritage of Clarke’s foundresses. Menu items included soda bread, Irish stew, fish and chips, colcannon potatoes, fried cabbage with Irish bacon, and red velvet cupcakes, a dessert favorite of BVMs. The afternoon concluded with a naming ceremony for the Barwick-Eppel Mail Center. 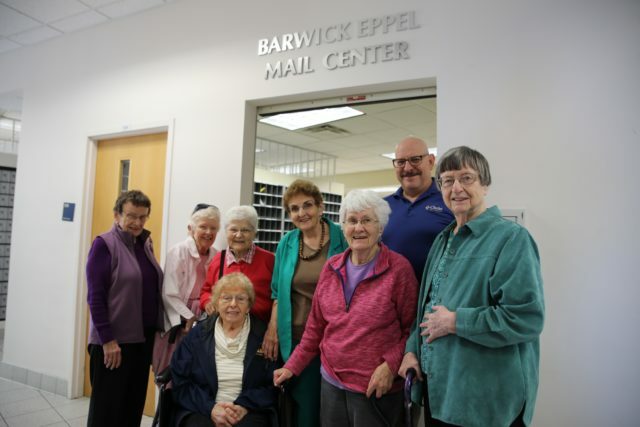 The designation of the Barwick-Eppel Mail Center commemorates 80 years of consecutive service to Clarke in the mail center by Rachel Eppel, BVM, who served from 1939 -1968 and Ramona Barwick, BVM, who has served from 1965 to today. It was a wonderful day for the Clarke community and special guests to gather in celebration of 175 years of providing outstanding educational opportunities to women and men.